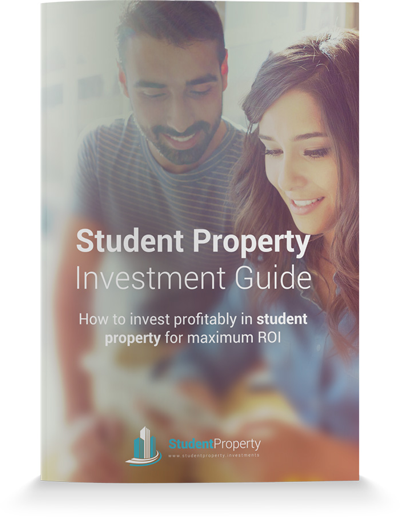 Find your ideal Student Property Investment using our smart investment comparison table. Arrange by Yield, Term, Buyback or Price. Then simply make an enquiry on all the properties of interest. Download our mini guide to find out all about investing in student accommodation - advantages, disadvantages and how to choose the best deal. Please don't contact StudentProperty.Investments for more information about any of the investments listed on this site. Feel free to contact us about advertising or your investments, or for other general enquiries. 1.1 "We" are Earth Immo Limited trading as StudentProperty.investments. Our office address is 24 Jacks Place, Shoreditch, London, E1 6NN. “We” are Earth Immo Limited trading as StudentProperty.investments (Student Property Investments) (company number 3871784) and our office address is 24 Jacks Place, Shoreditch, London, E1 6NN. We are committed to protecting your privacy. For the purposes of data protection law, We are the data controller. We are registered for Data Protection under the Data Protection Act 1998 - Registration number Z4966058. This policy explains how and for what purposes we use the information collected about you via www.StudentProperty.investments or any sites operated by Us (referred to below as “this Site”). You may provide Us with information in several ways, including by filling in forms on Our websites and landing pages, or by corresponding with Us by phone, email or live chat. This includes information You provide when You register for an account or subscribe, request contact from advertisers about property or investments We are marketing, enter a competition, promotion or survey, provide feedback or report a problem with Our websites or apps. This information may include any information You provide (for example, your name, address, email address, country of residence, phone number, company and comments). When you use Our websites or landing pages, We automatically collect information about Your device, including Your IP address, information about Your visit (including how You got to Our websites) and how You use Our services. - Providing You with the information, products and services You request from Us or one of Our advertisers. - Allowing You to participate in Our interactive features when you choose to do so. - Providing You with information about goods and services that We and selected third parties offer that may interest You, which may be based on inferences about Your likely interests based on Your activity on websites operated by Us. - Customising or enhancing Your experience of our services, which may use inferences about Your likely interests based on Your activity on websites operated by Us. - Delivering relevant advertising to You on websites operated by Us or third parties or in direct communications from Us, which may use inferences about Your likely interests based on Your activity on websites operated by Us. - Measuring and understanding the effectiveness of advertising We serve to You and others. - Ensuring that Our content is presented in the most effective manner for You and Your device. - Administering Our websites and apps and for internal business administration (for example, troubleshooting, data analysis, testing, research, statistical and survey purposes). - Protecting Our interests and those of third parties and as part of our efforts to keep Our services safe and secure. - Managing and operating Your account with Us. You have consented to Us using your personal information for this purpose (for example, when You create an account with Us, agree to receive marketing emails from Us or create an automated alert). You can withdraw Your consent at any time by deleting the information from Your account or updating Your marketing preferences. It is in Our legitimate interest to use Your personal information to operate, improve or promote Our services or to contact You. We may provide your personal information to advertising networks that require that information to select and serve relevant adverts to You and others. We may provide information about Your visit to analytics providers to help us improve and optimise Our services. We generally only share this information in a form that does not directly identify Uou. If we sell any business or assets, We may disclose your personal information to the prospective buyer of that business or those assets, along with its professional advisers. If Earth Immo Ltd (or substantially all of its assets) is acquired, personal information held by Us about Our users will be one of the transferred assets. We may disclose Your personal information if required to do so by law or in response to a request from law enforcement or another regulatory authority. We may disclose Your personal information to enforce Our agreements with You or to protect the rights, property or safety of Earth Immo Ltd, its users or others. This includes sharing personal information with other organisations for fraud prevention purposes. We keep your personal information for as long as is necessary for the purposes for which it is processed. These periods vary depending on the nature of the information and your interactions with us. If you would like to delete your account, please contact Us using the details below. Most Web browsers automatically accept cookies, but if you prefer, you can edit your browser options to block cookies. Some of Our services may not work as intended if You do so. You have the right to ask Us not to process your personal information for marketing purposes. You can do this at any time by updating Your email preferences in your account or by clicking on the “unsubscribe” link in any marketing email We send You. This link may at times be labelled with other text, such as “Manage my Preferences” or “Stop Receiving This Newsletter” or other similar calls to action. Data protection law gives You the right to access Your personal information, to object to the use of Your personal information for certain purposes, and the right to erase, restrict or receive a machine-readable copy of Your personal information. If you feel that Your request has not been carried out using the online tools provided, please contact us using the address below. We will handle Your request in accordance with the law. This means there may be legal reasons why We cannot fulfil all requests.